When Diane Aulger found out she was pregnant, she was overjoyed. Life had been difficult as her husband, Mark, had been fighting stage 3 colon cancer, but he had finally beat cancer and they were looking forward to moving on with their lives and bringing another little one into their family. Then doctors told them something that left them shattered – Mark was diagnosed with pulmonary fibrosis, a disease that stops the flow of oxygen from the lungs to the brain and other vital organs. Diane was heartbroken that her husband might not be there to see their daughter brought into the world, so she made a difficult decision that many found controversial. On January 18, when she was far enough along in her pregnancy, Diane went to the hospital to be induced so Mark could hold his daughter in his arms before he passed away. She thought she would be alone for the birth, but doctors actually allowed Mark to be there as Diane went into labor. With their hospital beds side by side, Diane gave birth to Savannah. The moment was a poignant one for the couple. While they were both overjoyed at the birth of their daughter, they didn’t know how much time they would have together as a family. Diane placed Savannah in Mark’s arms and, though there was pain in his eyes, he held her and told her he was her daddy and he loved her very much. Just days later, on January 23, Diane looked at Mark’s monitors and could see that his stats were dropping. 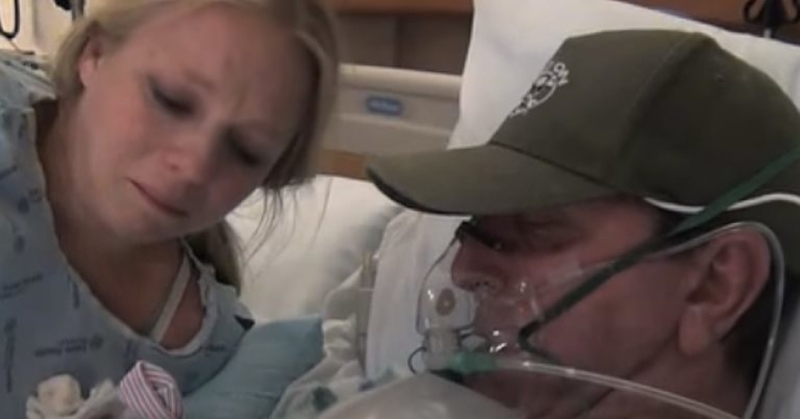 Knowing he didn’t have much time left, she placed Savannah in his arms and they held hands until he stopped breathing. While the whole situation was painful and difficult, and though many questioned Diane’s decision to induce labor, she is happy that her husband and daughter were able to spend a few precious moments together. Those are moments she will never forget. Are you glad Mark was able to hold Savannah before he passed away? So share this! 'The Karate Kid' Cast: Where Are They Now?